Rodama: a blog of 18th century & Revolutionary French trivia: Casanova, lover and lottery impresario? Casanova went one better than Voltaire and actually had himself made director of a French state lottery! The purpose of the lottery was to rescue the ailing finances of the École Militaire, a project which enjoyed the patronage of Madame de Pompadour. The intendant in charge was Joseph de Pâris Duverney, third of the famous Pâris brothers. He already had a lottery plan waiting in the wings, drawn up by the Genoese financiers, the Brothers Calzabigi, but he needed someone to ensure its successful adoption. He recognised in Casanova an individual with a head for figures and the necessary pizzazz to front the venture. Casanova certainly did not lack style. He had recently escaped spectacularly from his cell in the Palazzo Ducale in Venice and fled to Paris, where he arrived on the day of Damiens's assassination attempt (5th January 1757). He was now dined out on his adventures and, with the sponsorship of his good friend the new Foreign minister, the abbé de Bernis, secured introductions to the great and good, including Choiseul and Madame de Pompadour. Bernis commended him to the Controlleur-General Jean de Boullongne as a specialist in financial affairs: ("Try and invent something which will bring money into the royal coffers, but avoid complications and chimerical combinations"). Then came the invitation to dinner at Duverney's château de Plaisance in Nogent-sur-Marne, where he was presented with the lottery plan. Casanova remained convinced he had hoodwinked Duverney and Antoine Calzabigi into believing the project was his own idea. In any event, he ran with it. He successfully defended the scheme to the Conseil of the École Militaire, with d'Alembert on hand as mathematical expert, and it duly passed into law in January 1758. In organisation, the École Militaire lottery was a classic "lotto genovese", of the type run in Genoa since the early 17th century. Five numbers were drawn from a possible ninety and citizens could place stakes on the appearance of a single number or on a combination of two (an ambo) or three (a terno). (Bets on four (a quaterno) or all five (a cinquina) were rejected by the École Militaire as too risky). In theory the lottery would break even if six numbers were drawn, so that five should yield a safe profit. The draws took place in the presence of the Conseil of the École Militaire, first at the Arsenal and then at the Hôtel de Ville: a child would drew five balls from the ninety placed in a "wheel of fortune", with each ball containing a number). At the first draw (18th April 1758) the lottery made a profit of 600,000 livres, 400,000 from Paris alone. Only 18 or 20 ternes had been won but Casanova held that they had gained the lottery a brilliant reputation. 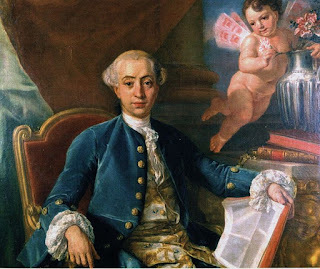 Casanova personally had taken 40,000 livres, with 6% commission, and paid out only 18,000 livres (though on the second draw he was not so lucky and had to borrow to meet a terna.) The lottery held five draws in 1758, its first year, and soon settled into a routine of monthly draws. It was taken over as loterie royale in 1776. As to Casanova, he rapidly became bored and moved onto pastures new, briefly setting up a workshop in the Temple precinct to print silk. Soon he was once more on the run from the police and lived for a time on the largesse of the marquis d'Urfe who had a weakness for the occult sciences. At the end of September 1759 he finally left Paris at the end of a three-year stay. Stephen M. Stigler "Casanova's Lottery" The Nora And Edward Ryerson Lecture, University of Chicago, delivered March 6, 2003. Helmut Watzlawick, "Casanova et les loteries" in Etre riche au siècle de Voltaire: actes du colloque de Genève (18-19 juin 1994), p.161-74.